Parks and public plazas are typically urban escapes you’d expect to find at street level, but when your neighborhood hosts a league of industrial warehouses, wastewater treatment plants, and sits along one of the most polluted estuaries in the country, it’s time to look up. While environmental groups toil to clean up the Newton Creek river, community leaders decided to create the Newton Creek Wildflower Roof as a luscious green space that helps support local wildlife and brings nature back to the area. Newtown Creek hardly flows, but rather rests between New York City’s boroughs of Brooklyn and Queens with a toxic combo of spilled oil, city sewage and other sludge. Thankfully, community groups are fighting to clean up the mess below and others are beautifying the spaces above. 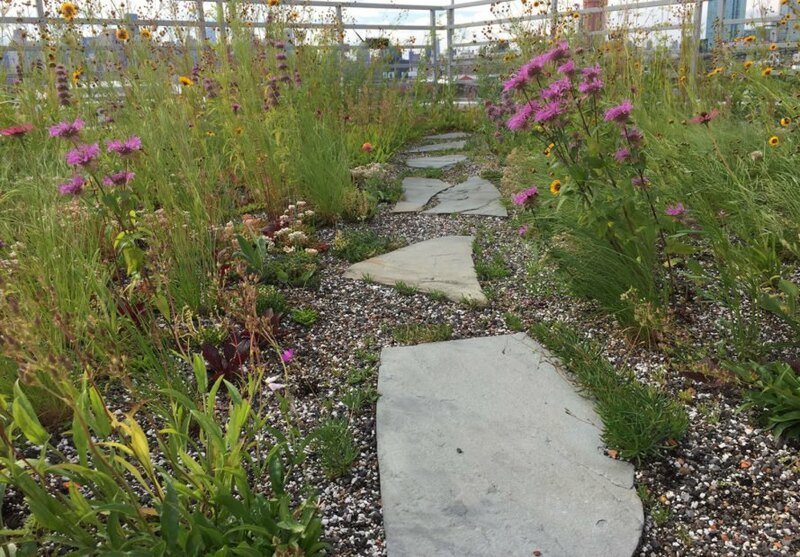 The seeds for the Newtown Creek Wildflower Roof were first planted in 2015 when Marni Majorelle and her landscape design company Alive Structures, the Newtown Creek Alliance, and the New York City Audubon applied for funding from the Greenpoint Community Environmental Fund. Their goal: to cultivate native flora that will support birds and insects in the neighborhood. The group’s funding request was approved for a 22,000-square-foot green roof atop Broadway Stage’s building on 520 Kingsland Avenue along Newtown Creek and in 2016, the first 10,000 square feet of green roof were installed. Today, the wildflower roof is covered with Prairie Dropseed grass and over twenty different native flowers species, including Orange Butterfly Weed, Tall Tickseed, Purple Coneflower, and Bee Balm. Busy bees can be seen pollinating the garden, buzzing from one bloom to the next while the massive silver “digester eggs” of the Newtown Creek Wastewater Treatment Plant loom in the distance. 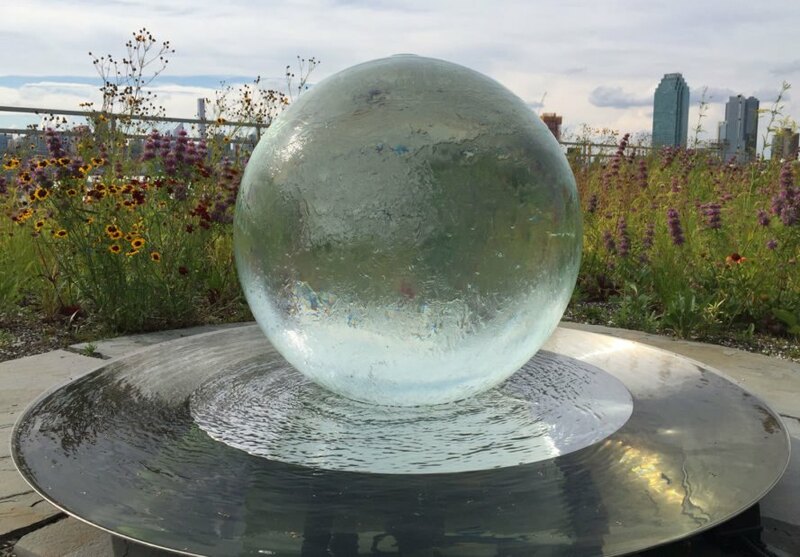 A spherical water fountain sculpture, the Aqualens by British artist Allison Armour, was installed this spring and serves as the center piece for the wildflower roof. Alive Structures is also working with Broadway Stages to introduce green roofs on its other buildings and using its funding to host workshops, festivals and educational lectures that get community members involved in the neighborhood’s revitalization. The upcoming Kingsland Wildflowers Sensorium (August 19 1pm–7pm) will be a celebration of the Greenpoint community and expose residents to ecology preservation through sensory stimulation, crafts and more. 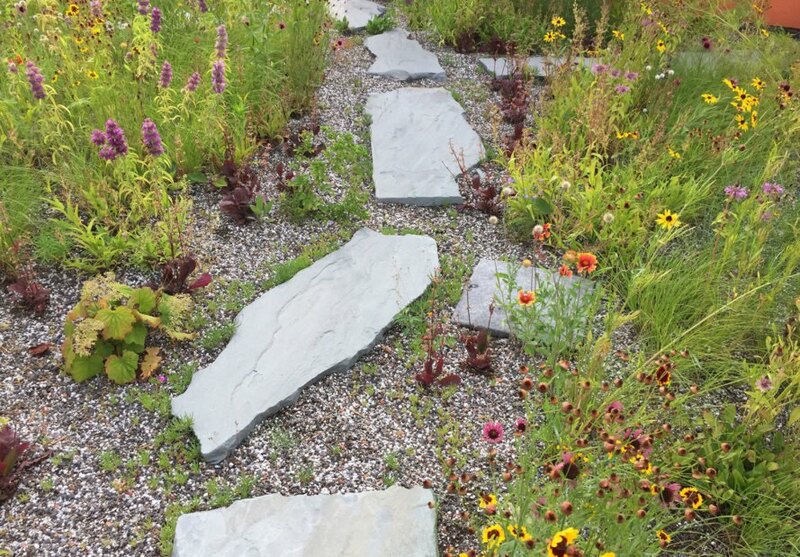 The 2nd Annual Kingsland Wildflowers Festival (September 23 12pm–4pm) invites all to explore the green roof and hopefully spark environmental activism in North Brooklyn. The Newtown Creek Wildflower Roof is still a project in progress with another 10,000 square feet currently being installed, but what currently exists is already a mini neighborhood oasis in a neglected pocket of industrial sites and gritty corners. Parks and public plazas are typically urban escapes you expect to find at street level, but when your neighborhood hosts a league of industrial warehouses, wastewater treatment plants, and sits along one of the most polluted estuaries in the country, it’s time to look up. While environmental groups toil to clean up the Newton Creek river, community leaders decided to create the Newton Creek Wildflower Roof as a luscious greenspace that helps support local wildlife and brings nature back to the area. Newtown Creek hardly flows, but rather rests between New York City’s boroughs of Brooklyn and Queens with a toxic combo of spilled oil, city sewage and other sludge. Thankfully, community groups are fighting to clean up the mess below and others are beautifying the spaces above. The group’s funding request was approved for a 22,000-square-foot green roof atop Broadway Stage’s building on 520 Kingsland Avenue along Newtown Creek and in 2016, the first 10,000 square feet of green roof were installed. 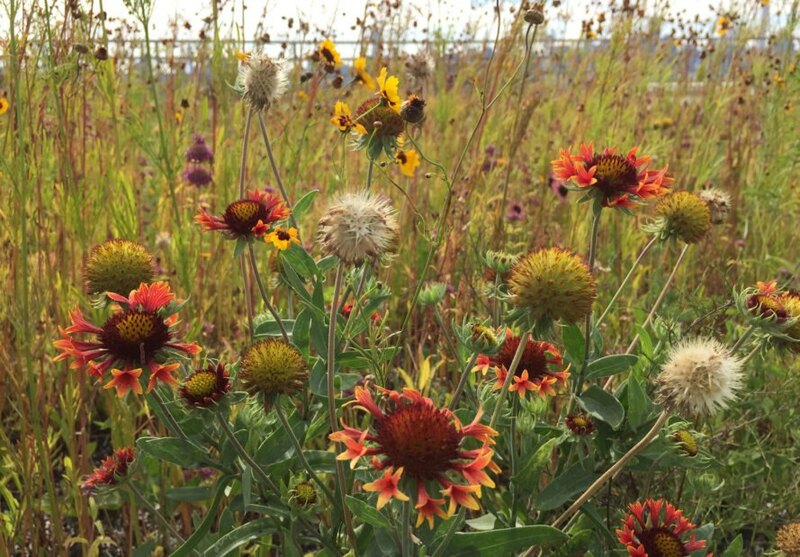 Today, the wildflower roof is covered with Prairie Dropseed grass and over twenty different native flowers species, including Orange Butterfly Weed, Tall Tickseed, Purple Coneflower, and Bee Balm. Busy bees can be seen pollinating the garden, buzzing from one bloom to the next while the massive silver “digester eggs” of the Newtown Creek Wastewater Treatment Plant loom in the distance. 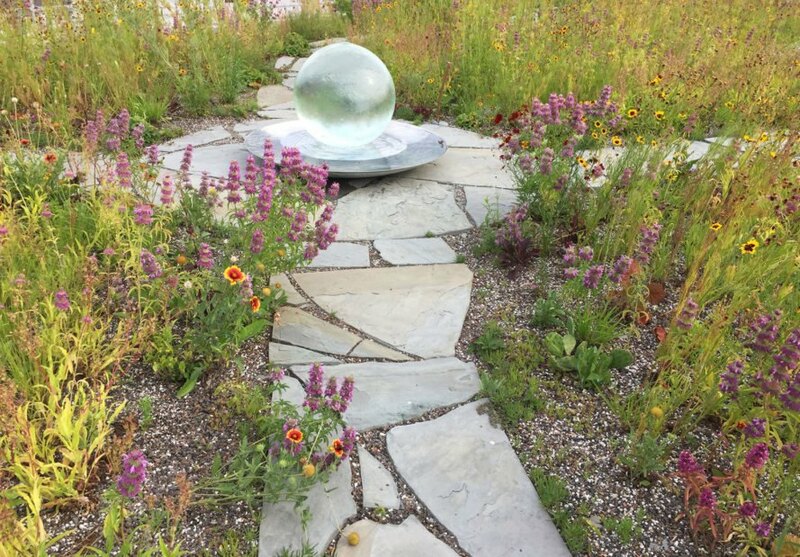 A spherical water fountain sculpture, the Aqualens by British artist Allison Armour, was installed in the garden this spring and serves as the center piece for the wildflower roof. Parks and public plazas are typically urban escapes one can find at street level, but when your neighborhood hosts a league of industrial warehouses, wastewater treatment plants, and sits along one of the most polluted estuaries in the country, it’s time to look up. Alive Structures is also working with Broadway Stages to introduce green roofs on its other buildings and using its funding to host workshops, festivals and educational lectures that get community members involved in the neighborhood’s revitalization. The upcoming Kingsland Wildflowers Sensorium (August 19 1pm–7pm) will be a celebration of the Greenpoint community and expose residents to ecology preservation through sensory stimulation, crafts and more. 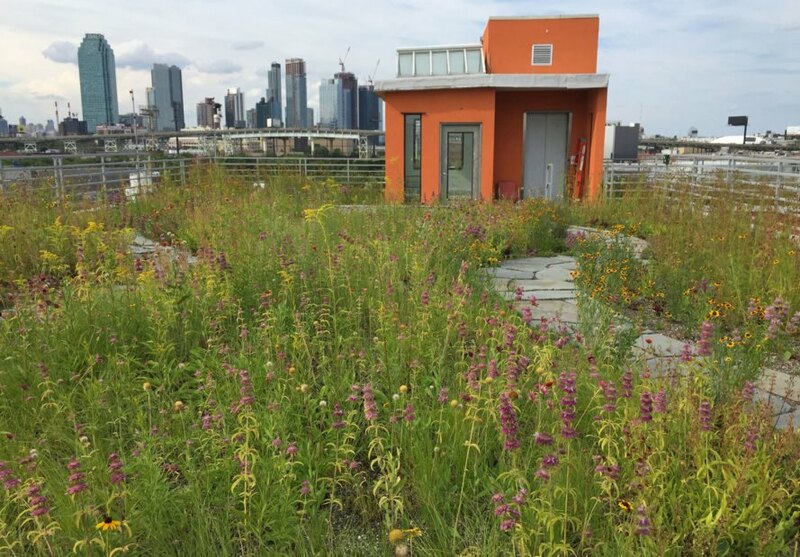 The 2nd Annual Kingsland Wildflowers Festival (September 23 12pm–4pm) invites all to explore the green roof and hopefully spark environmental activism in North Brooklyn. Pretty flowers cover the garden. Grass carpets the roof and tries to find its way between the pavers. If you keep your gaze on the path, you could almost forget where you are. A small staircase and elevator take guests right up to this slice of breezy, peace. Looking over the rooftops in Brooklyn and Queens. The neighborhood is in great need of clean, green spaces. Stone paths carve their wave through the garden. Bees hover from flower to flower, doing their work to keep the wildflower roof blooming. The Newtown Creek Wastewater Treatment Plant (seen behind the rooftop garden) is the largest sewage treatment plant operated by the NYC Department of Environmental Protection. 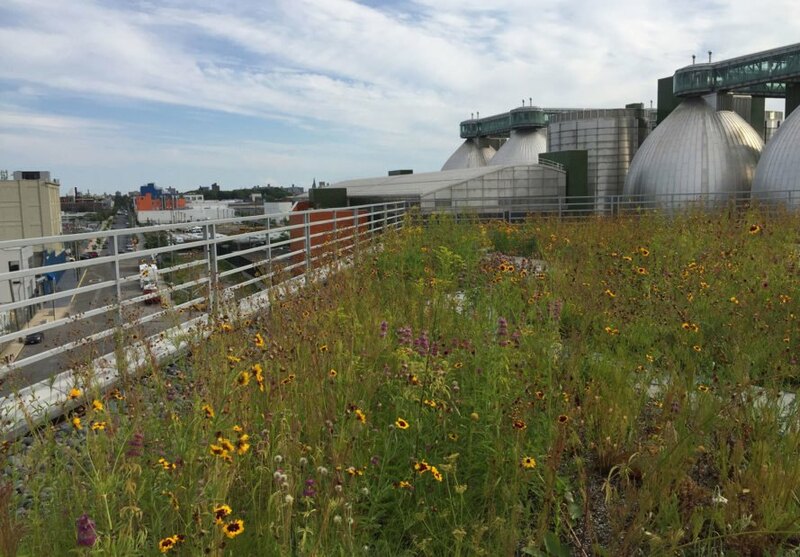 The Newtown Creek Wildflower Roof is still a project in progress with another 10,000 square feet currently being installed, but what currently exists is already a neighborhood oasis in a pocket of industrial sites and gritty corners. 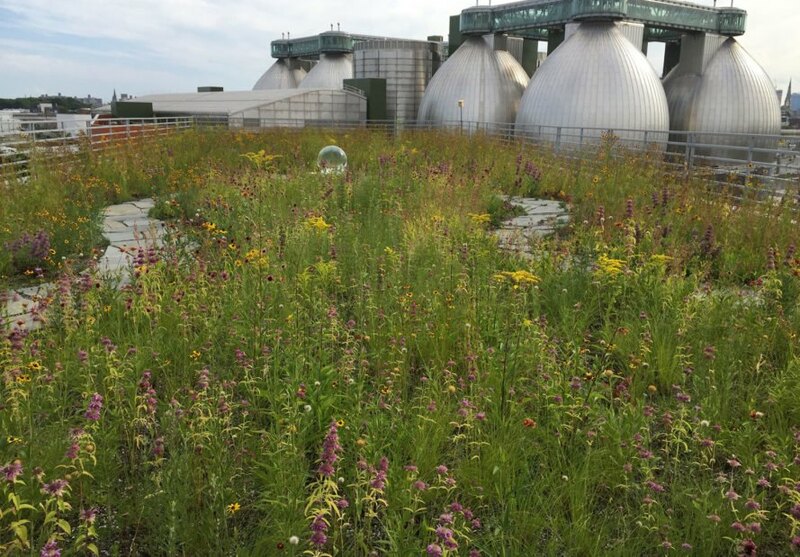 The seeds for the Newtown Creek Wildflower Roof were first planted in 2015 when Marni Majorelle and her landscape design company Alive Structures, the Newtown Creek Alliance, and the New York City Audubon applied for funding from the Greenpoint Community Environmental Fund. Their goal: to cultivate native flora that will support birds and insects in the neighborhood.